These fun new puzzle games are the best for unique, challenging word play! 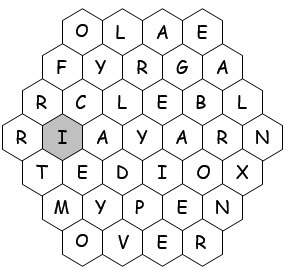 You need to find the answers to crossword-like clues by searching through a honeycomb of scrambled letters. Challenging, fun and very sweet! 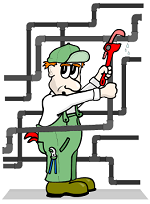 You can find a sample puzzle and complete instructions here. Here's a peek at the printable page. The full text of these new puzzle games also appears below. The shaded I and the six letters surrounding it spell ERRATIC, which matches one of the clues below. In the same way, find a 7-letter word for each of the remaining clues. Keep track of the center letter for each answer you find. 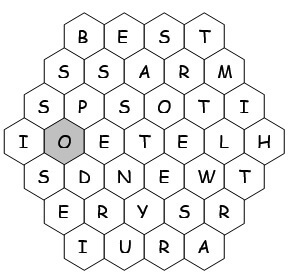 The shaded O and the six letters surrounding it spell DISPOSE, which matches one of the clues below. How did you do? If you're ready to check your answers for this Buzzword puzzle, click on the button. 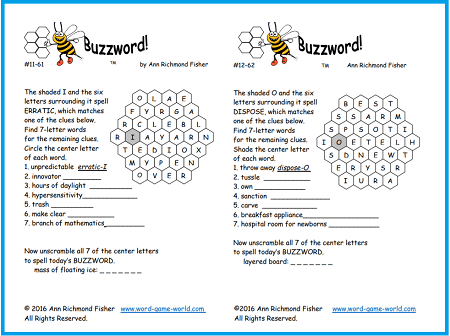 We'll be adding more Buzzwords in the future, so please check back again for more of these free word games. More New Puzzle Games for You! NEW! Nifty Nines One of our new puzzle games that requires you to answer questions about idioms and expressions that contain NINE or NINTH. Triangulairs TM- Unscramble a 10-letter word and form 4-letter words following one simple rule. Try to meet or beat our scores! ZigZags TM - A fun-shaped puzzle to test your spelling and vocabulary expertise. We've supplied some of the letters in the seven-letter words. Can you figure out the rest? Occupational Hazard - Don't say I didn't warn you..but some of these questions are nearly impossible, unless you are a word connoisseur with a bit of patience! Smelly Stuff Cryptogram Puzzle: Just what might we put on this list? For fun, first jot down your Top Ten list. Then hold your nose decode this cryptofamily and see if any of your items made our list!